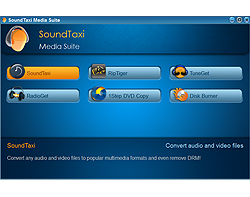 Each edition of SoundTaxi converts any audio files, but SoundTaxi Professional and SoundTaxi Pro+VideoRip do it much faster. Besides SoundTaxi Pro+VideoRip converts both any audio and video files. The trial (unregistered) version of SoundTaxi includes all features of (is equal to) SoundTaxi Pro+VideoRip version, but has limitations for output file duration. You must be able to play your original files on your computer.